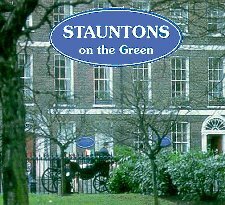 Stauntons on the Green is situated in St Stephens Green close to all major tourist attractions and shopping facilities. The standard of accommodation is excellent and the very friendly staff will do everything possible to ensure that the guest will experience an enjoyable visit. The ideal location makes it possible to enjoy the best of both worlds, the peace and tranquility of a stroll in Stephens Green park and the bustling night life in Temple Bar. There is a choice of single, double, twin, single double or family rooms. The beautiful en suite rooms are equipped with all necessary facilities for comfort. Facilities include TV, direct dial telephones, trouser presses, and hairdryers, tea and coffee making facilities and laundry service. And for garden lovers Staunton's has its own private gardens to the back offering complete peace and tranquility and behind them is the splendid Victorian Iveagh Gardens. Stauntons is a sanctuary of peace in a busy cosmopolitan city. Grafton Street which is a shopper paradise and alive all day with the sound of music is just a short stroll away. Trinity College with the Book of Kells and the Old Library is a minute away and as you cross from Grafton Street to Trinity you can say hi to the statue of Molly Malone as she “wheeles her wheel barrow through streets broad and narrow” A ten minutes saunter brings you to Temple Bar with its fine selection of pubs, coffee shops, cafes and restaurants and the hottest night life in Ireland. Dail Eireann, The Natural History Museum and The National Gallery are within easy reach, as are Dublin’s main theatres.